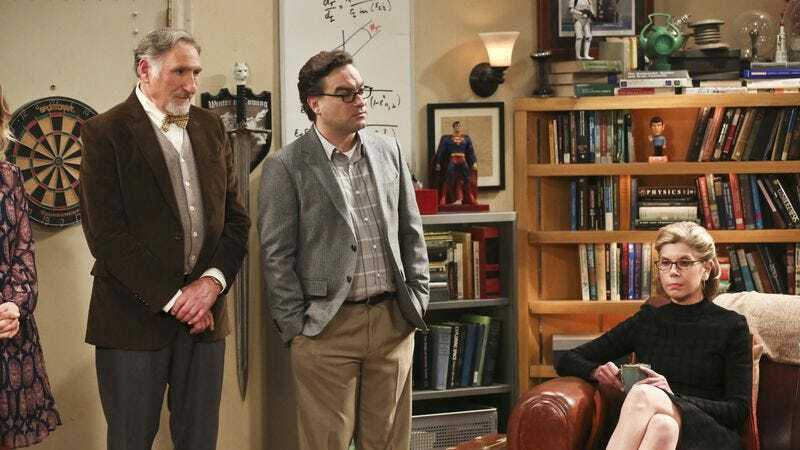 “The Convergence Convergence” is the ninth season finale of The Big Bang Theory, but it couldn’t feel less like a season finale. More often than not The Big Bang Theory ends its seasons by resolving some conflicts or pulling off a “big moment” to set up the following season. It’s an approach that’s used by most sitcoms, and for awhile it looked like the ninth season of this show would be no different. Last week’s episode set up the idea of Leonard and Penny holding another, unofficial wedding ceremony so that their friends and family can attend this time around. Strangely enough, “The Convergence Convergence” doesn’t get to the ceremony—it’s looking like that will be the season 10 premiere—but rather picks up where last week’s episode left off and portrays the gang getting ready for the impending ceremony. Pulling the ceremony together means Leonard invites his rarely-seen father, much to his mother’s chagrin, and Sheldon invites his mother, bringing the three very different people together in order to create comedy and conflict. It’s an intriguing choice to have the season finale focus so heavily on very minor characters that only appear, at most, once a season. Rather than building on all the drama from earlier this season, the finale feels like a tidy, one-off episode that’s barely connected to anything that came before it. There’s no real mention of Leonard and Penny’s previous ceremony, and no look at how it may have affected their parents and friends. Instead, “The Convergence Convergence” sees everything go off without a hitch. That means that, for the most part, the finale lacks a certain amount of punch. There’s not much in terms of good comedy, and the potential for more emotionally rewarding storylines is removed as soon as it’s clear that this episode is going to be about Mary, Beverly, and Alfred rather than the core group of friends. Still, while the episode is a little underwhelming in that it doesn’t really engage with the overarching narratives of this season, which is just baffling for a season finale, the guest performances provide some welcome freshness. There’s an old-school sitcom vibe to the interactions between Judd Hirsch, Laurie Metcalfe, and Christine Baranski. These are actors who know how to deliver comedic lines, and it shows. Now, that old-school sitcom vibe means that some of the jokes are reductive and worthy of a few eye rolls, relying as they do on played out notions of emasculated men in marriages, nagging wives, and pushy Christianity. This isn’t new territory, and a few of the jokes fall flat, but there’s no denying the chemistry between the three veteran actors. They bring a certain zip to the dialogue that’s just not normally there, and it’s delightful to just sit back and watch. There’s a well-worn hatred taking up space between Beverly and her ex-husband Alfred, and Hirsch and Baranski are clearly having fun playing it up, making sure every insult and putdown is as pointed and venomous as can be. Then there’s Metcalfe, who gets to play the saintly one alongside Alfred, the two sharing a chemistry and, by the end of the episode, a hotel room. As great as the guest performances are, it doesn’t exactly elevate “The Convergence Convergence” to something memorable. It really feels like The Big Bang Theory missed an opportunity here. Having Leonard and Penny plan another wedding ceremony seems like a great opportunity to dig into the first year of their marriage and show just how far they’ve come and if they’ve managed to work out the issues that made the beginning of their marriage a little rocky. “The Convergence Convergence” never really gets into any areas of conflict though, and it doesn’t feel like the right decision. This season spent so much time focusing on Sheldon and Amy that, as a consequence, Leonard and Penny’s relationship was relegated to the backburner. It’s as if the show finally pulled the final trigger on the “will they or won’t they” storyline and then decided that no more emotional excavation was needed. It’s a shame because there’s real potential for intriguing dynamics within Leonard and Penny’s marriage, and the show would be well-served in exploring that shifting dynamic. After all, The Big Bang Theory showed it could do it with Sheldon and Amy, turning in some of its best episodes-long character work earlier this season. The ninth season of The Big Bang Theory has been surprisingly consistent. I say “surprisingly” for two reasons: 1. because last season was rather underwhelming, and 2. it’s not often that a sitcom this many seasons into its run still finds ways to challenge its characters. The show did that continually this season, especially with Sheldon and Amy, but the follow-through in the back half of this season has been troubling. The guidance system subplot has lacked any sense of momentum or importance, Bernadette is hardly a character anymore, her pregnancy barely mentioned from one week to the next, and Raj continues to be a one-note caricature. While “The Convergence Convergence” allows Hirsch, Metcalfe, and Baranski to let loose, it doesn’t fix any of the problems present in the back half of this season, making for a decent but ultimately inconsequential season finale. Amy just wants to be Maid of Honor, even if that means just standing close to Penny while wearing a purple satin dress. There’s nothing quite like a well-timed veggie crunch in a quiet room. That’s a wrap on season nine reviews! Thanks for continuing to read and chat about this show with me every single week. Looks like we’ll be picking up right where we left off when the show comes back for its tenth season. See you then!